Go for it! Just remember, I have never heard of (or can't remember...) The Scarlet Man. Other than that, have fun with my backstory! Hair color: Blonde, some days it appears strawberry blonde. Most used phrase: Of course not, it isn't like they meant it! Favorite Rifle: I don't use rifles... too old school. Personality: Calm, almost never panics. I am usually trying to help the most I can without socializing too much. I am completely introverted and try not to talk too much, unless needed. I am skilled with pistols, and hate when I miss my target. Hobbies: Learning as much as I can about the Scarlet man, and trying to avenge my allies. Allies: My most trusted partners are Charles Lampspeaker, and Miri Macsong, who have journeyed with me for years, and have defeated many automatons with me. Role Models: Emily, who really was the one who taught me how to handle a weapon. And the Scarlet Man, who has looked out for me all my life. 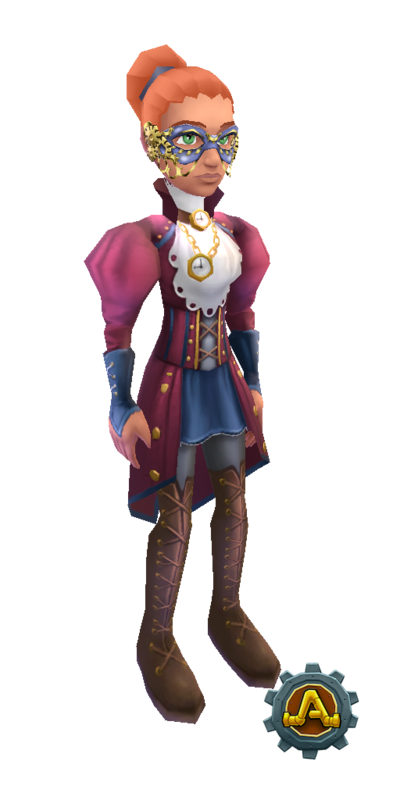 Likes: Collecting things like ice flowers, feathers, cogs, etc. Dislikes: The lazy urchins who litter everywhere. Talents: I'm fast. I've been all over aethesia and know how to get to all different places. "Shall I describe it for you or would you like me to find you a box?" -Legolas, the Two Towers. I think I'm going to redo mine too, just because I have no idea what I was thinking when I wrote the first one and things have changed. Usual Weapons: She is never without a hammer, but she is comfortable with canes, Ice/Fire Sticks, and other sword-like things. Usually doesn't mess with guns, though, cause she's a lousy shot. Most Used Phrases: "Oy.../OY!" "Well, that happened." "Oya!" "What'd I miss?" "Ya think!?" Least Used Phrases: "REGRET! I REGRET!" "I was not ready for this!!!" Personality: Aislinn's bouncy, optimistic side is her strongest side. She's rarely in a bad mood, but her anger and frustration can easily get the best of her. She often acts ditzy and clueless even though she's extremely intelligent and perceptive, because her enemies often underestimate her. When irritated, she can exude high levels of sarcasm. Perhaps her most distinctive feature is her reckless curiosity and sense of adventure, caused by her Aethermatron prosthetic heart, which overrides her common sense and timidity and intensifies her love of danger. Hence, she very rarely goes a day without getting herself into some kind of predicament. She is also very fearful, but masks her fear with cockiness. Weaknesses: Easily distracted, sketchy aim, emotional, did I mention distracted? I have too keep updating this! Personality: Friendly. Bold. Dramatic. Sarcastic. Daring. Has a secret, well kept, fiery temper. Emily makes friends too fast which sometimes is bad. She likes fighting Automatons. She wants to help anyone in trouble. She’s a follower, not a leader. She has trouble understanding instructions and is often getting into mischief. She likes animals. Likes: Cats, Horses, Birds, music, talking with friends, Griffins. Dislikes: Frogs, the color pink. Weaknesses: Milk Chocolate. Kittens. Fog. Pressure. Music. Fears: Nothingness. Friends turning on her. Her secrets being revealed to the wrong people. Talents: She is smart without knowing it. Singing. Enemies: Lucky, Automaton Goats, Hans Oddcraft. Allies: Scarlet Man, Great Engineer, Iliara, Scarlett, Ilayne, Jacoby, Hanna, Goku, Ariella. Hair Color: Red/orange, worn in a bun with side-swept bangs; is usually never worn down. 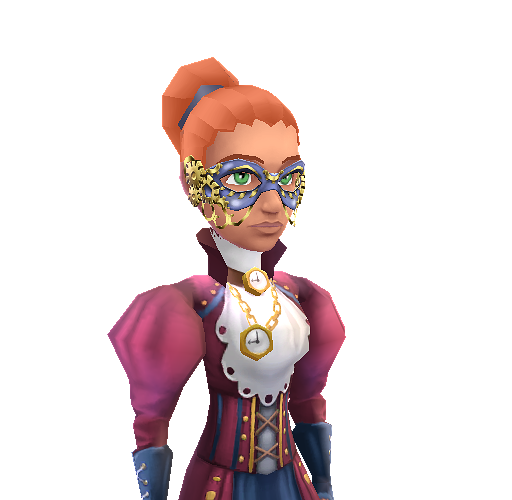 Favorite Outfits: Coat Tails Suit with Golden Gears Mask or Faux Fox Finery with Feathery Façade Mask. (See "Signature Outfits") Favorite hat is the Egghead Hat. Favorite Weapons: Flintlock Sniper Rifle, Icicle, Smoke Bombs. Attack Details: Often uses pink-wrapped sniper rifle to bash someone over the head. This is known as "tree-whacking" since Ari usually is found hanging from a tree when on lookout duty. Other common attacks include electrocuting automatons (and people) with the Dulcet Defense Vambrace or freezing them with the Icicle. She also prefers to snipe enemies from a distance than engage in hand-to-hand combat. Often, she will use smoke bombs to cover a retreat, as well as distract an enemy or force them out of their hiding place. Most Used Phrase: "Oy!" or "My goodness...."
Least Used Phrase: "I can't believe this...."
Character Qualities/Faults: Somewhat arbitrary and crazy; strategical at times because of her training at the Academy Automicus; extremely loyal to the Scarlet Man and the Resistance. Her friends mean the world to her, and she will do anything to protect them. In stressful situations she will sometimes overreact and do or say things that are less than helpful. Though usually even-tempered, you really don't want to annoy her or get on her bad side. Allies: Everyone in the Resistance. Greatest Fears: Fog, being betrayed, losing her friends or her sister. Random Facts: Likes to hide in shadows, climb trees, and play chess. She also owns a tea shop, known by the names of "Ari's Tea Shop", "Newheart Tea Emporium" or simply "The Tea Shop". 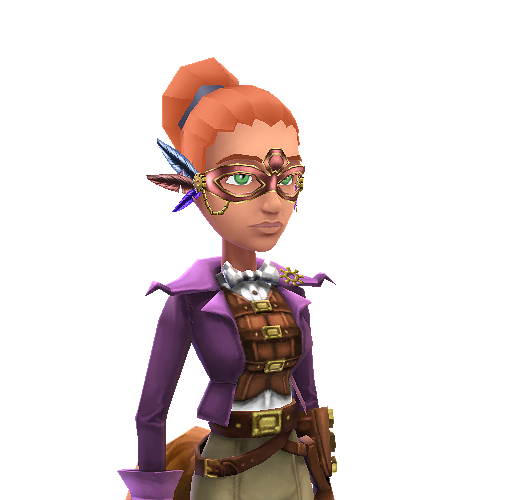 Her sister is Arona Copperburst and her apprentice is Iris Darkspark. She sometimes calls people bampots. 'Ariella' is pronounced Ahr-ee-ELL-a. 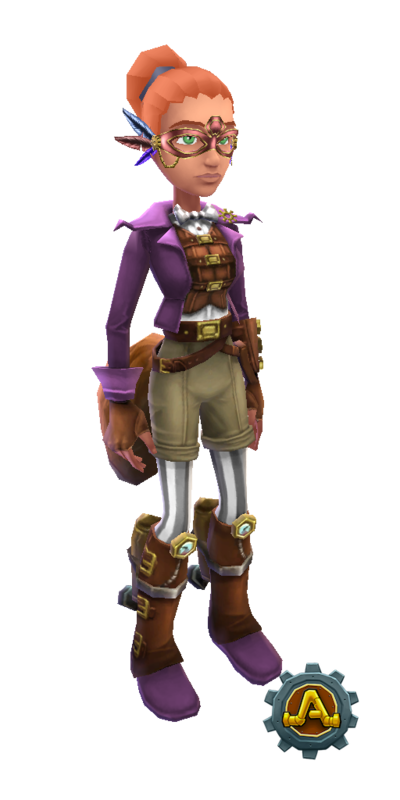 Favorite Activities: Making cookies and tea, reading or drawing on the Old Mount or in Smuggler's Cave. Favorite Automatons to fight: Combustonauts, Bombardiers, Troubleshooters. Least Favorite Automatons to fight: Grease Monkeys, Oscillators, Pacifier Officers, Minions, Technomites, Snapjaws, Troublesnakes. Specialities/Hobbies: Science, Drawing, Writing, Smashing Automatons. Pet Peeves: People who are annoying, perfect hair, arguments. Wait... Why didn't I know about this? It would have been so helpful to me earlier. Hair: Black, changes often since I almost never comb my hair. Usual Attire: I don't remember the last time I checked, all I remember is I have the Flying L hat most of the time. Usual Weapons: Anything. Plus my brain. Oh and don't forget my signature weapons!! Personality: I'm crazy, just remember that. I'll mess with your mind, and then I'll mess with my mind, then I'll mess with yours again. Hobbies: Messing with minds, messing with Aislinn's plans, messing with a chess board and chess pieces and my own personal endeavours. Talents: Gossip always gets to my ears at some point, you want info, I have it. Markmanship? Ehh... not the best, but not the worst. My word is triple-A and plated in gold. I never turn back on a promise. Most used phrase: Think with your head; not with your mouth. Least used phrase: I’m so excited to be on-mission with you! Personality: Seems introverted at first. Once you really get to know her, she becomes much more extroverted. She has No particular fondness to those ‘less then bright’. She is very smart, and has lots of common sense. She doesn’t make friends quickly. She is slow to act and quick to mouth off. She is very snippy. Role models: the scarlet man, those put in authority over her. Talents: battling, she has a great memory, very smart, great at interrogation, after a few moments of being around a person, she knows how to get what she wants from them or get into their minds. Brief background: Born and raised in the resistance, became a detective, and was assigned to a special ops team. Her team disappeared and she worked alone for a few years. Alaxander pulled her out of that and assigned her to an interrogation job. After that, she ran smaller, solo missions. She was then assigned to work under @Gloria_Oldenpinner. No further information. Most used phrase: What does that do? Role Model: No one. It used to be @Gloria_Oldenpinner, the famed detective, when Nola used to be a detective, but now that she's on her own, it's no one. Hello everyone! I was told that this would be useful for any role-plays, so... Ta-Da! HAIR COLOR: Dyed gray, but is naturally blonde. EYE COLOR: Gray as well. LEAST USED PHRASE: Nevermind that. PERSONALITY: Smart, calm, introverted to an extreme, (unless the person is nice). Has good aim at automatons. HOBBIES: Taking early morning walks, and tinkering with scraps of metal. ENEMIES: Lucky, and his evil troop of automatons! FEARS: Losing control of my greed. LIKES: Finding treasures, and polishing them up. DISLIKES: Getting lost, with no one there to help. TALENTS: Quick-footed. Tactical thinking, strong memory. There we go.. All finished! I'll make my post soon, unfortunately I have to go ATM. To quote Terminator, "I'll be back." Loyalties: ASA, the Aethasian Secret Agency. Abilities/Talents: Quick thinking; Coming up with plans; Being in charge without being "the boss"
Most Used Phrases: "Let's do it." "Come on, let's go." "Sounds like a plan." "Very well then." "Well alright then." Least Used Phrases: "WHAAAAA??" "Cool man!" Hobbies (When She's Not Fighing Autos or Completing ASA/Resistance Missions): CRAFTING, of course! Also she likes to draw in her spare time. I may add in more later, but that's just about it for now! Phew, that took a while. Quick addition: What I mean by that is the boss of the ASA or the Resistance, Alexander, or whoever Sierra's boss is, being satisfied with Sierra's work, not the boss's own lol . . . Hopefully that makes sense . . .
Nicknames/Aliases: None that I wish to list here. Outfit: Red dress, top hat with a red feather. Most used phrase: Do you like my feather? It is red, yes? Personality: Dark. Cynical. Secretive. Crafty.